All day I have craved comfort food. This morning it was elderberry french crepes and for lunch a spicy chik fried tofu with homemade cajun dipping sauce guaranteed to warm you up. Tennessee is a leader in soybean production and more and more farm to table restaurants are including tofu on their menus. Some people balk at tofu. However, it is a healthy, fermented food, (think of cheese) and it does not have the hormone disrupting properties of soy. Tofu is very, very good for you. I eat these the way some people down chicken nuggets. Prepared Southern style, this dish is one of my favorites! Mix the spices with the flour. 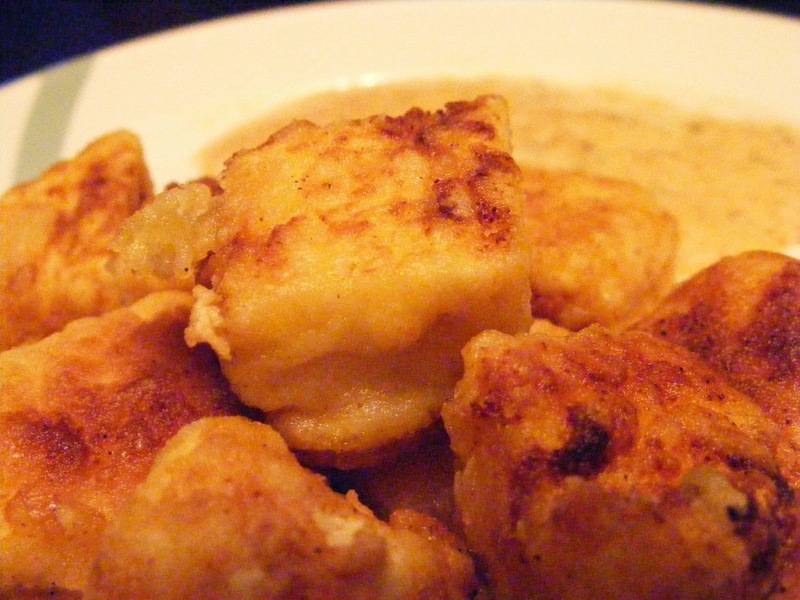 Cut tofu into cubes and roll in the spice flour mixture. Give it a minute or two to adhere well. The tofu does not require being dipped in egg. Drop the cubes into a heated oiled pan and cook until golden. For the dipping sauce, take the same spices plus 1/4 tbs parsley flakes and add to one tablespoon soynaise or regular mayo and add one tablespoon hot mustard, mix well. This dish is amazingly simple, and well, simply amazing. It makes a great snack for movie or game time too. Now dig on in!